Do you remember that cool guy in class, that stood quietly in the background, but always seemed to know everything that was going on? That guy who never got beaned by a ball, or smacked in the back of the head, because he always seemed to know it was coming? Oh, wait, of course not, because you are that guy, aren't you. Commandos are those unique individuals that have proven to have what's called "situational awareness." They just seem to know where everyone is on the battlefield, and have an instinct for where they're going. These individuals, also distinguished by their marksmanship, are given over to training in specialized weapons and tactics. Sometimes called a sniper, this is not truly your role. You do carry a deadly sniper rifle, but you're also the spotter for your team. Your scope has a transphased optic system, able to see cloaked ashrak. 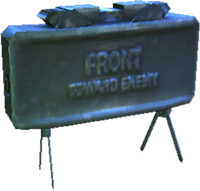 You also carry claymores to cover your rear, setting an explosive trap for your enemy. When all else fails, a guy like you doesn't settle for the standard .9mm handgun. You brought your own. A .50 caliber pistol able to put even the most determined foe on the ground. The scientist may get all the attention on the battlefield, but that's how you prefer it. You like to find a nice spot, set up a claymore, and then settle in to relax, and get to work. And work is good! Your primary role is as a standoff weapon, putting down jaffa and ashrak (and goa'uld foolish enough not to have their shield up) from a great distance, preventing them from even getting close to your team. But, you also are a vital support agent, killing goa'uld trying to drain the minds of your soldiers, and capping ashrak as they sneak up behind your scientists. Watch everything, and take every shot. But, beware that your bullets travel at such a velocity, they often leave a visible trail. The enemy you miss probably knows where you are. The one you hit certainly does, and is coming for you. Keep to the shadows, and displace from time to time, and you will enjoy a long and effective life. And keep those claymores placed to cover you and your team. At close range, your best friend is your .50 cal pistol, but the rifle packs its full punch even when not scoped. It's just notoriously difficult to aim accurately without the scope, so beware. When the enemy has spotted you, and you're being effective, know that you've got a bull's-eye on your back. Don't wait for them to come to you. Move to some place where you can watch over your previous location, and kill anyone who comes looking for you in that spot. Then, move again. 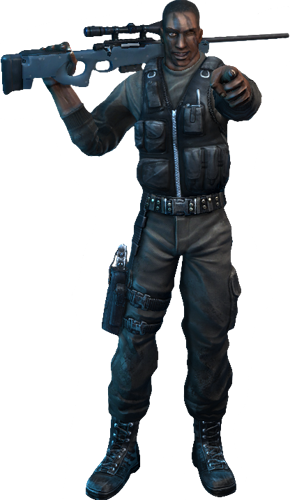 A commando with a routine of rotating between multiple key locations can often catch the same foe over and over, driving them mad, and making them dead. Have fun out there! This rifle is feared universally by the System Lords. One shot is all it takes, if your aim is true. Only the ashrak is as deadly, and she must sneak up behind you. You can drop your enemy from across a courtyard, and remain unseen and untouched. Two to three hits will kill any foe, but a headshot is lights out even for the massive jaffa. Just remember to watch your ammo, and reload whenever you get the chance. The bolt action weapon only carries four rounds, and must be manually loaded. Does your mother know that your best friend is an explosive? Well, if she did, she'd approve. Your claymores will never let you down. They're always there for you, and tirelessly watch your back. Just the sort of friend your mother wishes for you. Set them in doorways or any other approach to your rear, and then focus your attention on the battlefield before you, secure in the knowledge that their explosion will give anyone sneaking up on you cause to rethink their life plans, and also give you warning enough to turn and finish them off with either pistol or rifle. Sometimes a rifle's too big for the job, but there's never a time when a big bullet is too much for the job. The .50 cal pistol carried by the commando scares even him, sometimes. Loud, powerful, and with a kick like a mule, it's a bit harder to aim, but well worth the trouble in his calm hands. Never be afraid to use this in close quarters. A few hits with this will finish most arguments. I love my job. Let me say that again. I love my job! Every day, I get to hunt down the snake-heads and exterminate them. I’m the best shot in this, or any galaxy. When I’m not in combat, you’ll find me on the range, training with my LR30. No alien garbage. No zippy electronics to fail. Just a beautiful, clean bolt action and a third of an ounce of metal traveling at 2,800 feet per second to wherever I send it. Clean. Precise. Final. I’ll never regret that training in explosives either. I can’t tell you how sweet it is to lay a trap with some claymores and catch the bastards sneaking up behind me. I confess, I do enjoy some of the toys. The boys in tech hooked me up with some sweet vision enhancement that make even those blasted Ash’rak cloaks useless. Can’t hide from me! And I managed to get them to give me some armor piercing ammo that makes those silly P90 rounds look like BBs. But, in the end, I trust the simple technology of the gun over anything else. I get flak from my commander, but I won’t go anywhere without my Desert Eagle, either. I know it’s a cannon, but that’s the point. If I HAVE to pull that thing, I want some power, and not one of those little pea shooters they give the scientists. I’ll be sad to see this war end. But I’m going to do my best to end it, and fast. Consider the goa’uld an endangered species! This was a real screw up. Someone upstairs needs their head examined, that’s for sure. We should have expected the snake heads would show up. They always seem to. And instead we left some inexperienced troops guarding the gate, and didn’t even set up sensors to detect Ashrak. I realize not every mission is a direct military assault, but they all seem to wind up that way, so why the hell don’t we just start them all that way? Maybe more of us would have gotten out of there alive. To their credit, everyone held their own. When the damn snakes started flooding through the gate, nobody panicked. We established a good base of fire, and then slowly started pushing forward toward the gate. Without good teamwork, we’d have been cut to pieces. I found myself lighting up Ashrak for my team and plinking them fast, just to kill their cloaks. No time for head shots. No time for fun. Just spot ’em and let the soldiers drop ’em. That temple was too crowded, anyway. Most of the fighting was close quarters. I hate close quarters. Claymores really mess with your hearing indoors. I may never get it back in my left ear, even with one of those fancy healing devices. I think I lost more blood from my ears than I did from that blade I took to the side. We lost too many. We lost the mine. I know we won’t let the System Lords keep it, but that naquadah could really help us in this fight. Next time… Next time, we’ll be ready. I love clean objectives, and a mission that goes according to plan. Of course, chaos is always a part of our plans, these days. Seems there’s just no way to meet the System Lords and not have Murphy heavily involved in the battle. We were dropped off by cloaked transport underneath the System Lord blockade as planned. Thing is, nobody told us the primary objective of the System Lords was the weather control device’s data cores, and that those cores happened to be located in the same building we needed to secure, to reactivate the planetary defenses. I guess that worked in our favor, since it kept them from destroying the building outright. But it meant, as per usual, what was meant to be a simple in and out, stealth mission turned into a major frontal assault. Piramess used to be a beautiful place. Maybe once they clean up after the attack, and let the weather systems work for a while, it will be again. All I can say is, turning that machine on after it’s not been running for a long time creates one hell of a storm. Can’t see anything, and that makes my job next to impossible. We found ourselves fighting trying to keep that damn device off almost as much as we struggled over the crystals for the defense systems, and keeping the data cores out of the snake head’s hands. In the end, they got away with half the data cores before we managed to turn the defense systems back on, and drive their ships from orbit. I don’t really know what that data will do for them, but at least they don’t have enough to build a weapon any time soon, and the civilians can return from the hills and hiding places they’d taken refuge in. I’ve never fought at home, before. I know the SGC’s been attacked. I was even in the backup ground team in Antarctica. But somehow, this was different. Unsettling. You know when old people ask each other what they were doing when Kennedy was killed, or Martin Luther King was shot? I get that, now. Something flips a coin in your perception of the universe. I’m embarrassed to say that, on some level, this was a game to me. Notches on a stock. I don’t think of myself as callous, or cold, but I suppose in my line of work, a certain detachment from emotion is healthy. It’s not tough, taking a long cargo ship ride to a fight, or even working yourself into the right mental space during the final briefing in the gate room before the cold blast of the gate consumes you. During that time, I put aside Axsel, and I’m Captain… er, Major… Reynolds. That’s going to take some getting used to. Axsel, the guy that chats over coffee and jokes about last week’s episodes of Two Dudes, gets buried deep. If I don’t, I can’t be that guy anymore when I get back from the mission. I didn’t get to do any of that psyching this time. I was actually in the elevator, on my way down to the gate level, when the device went off. No gun. No idea what’s going on. The emergency secondary power came on almost immediately and the elevator resumed, but I had to dodge snake heads flooding around the corner, and fight an Ashrak just to get to the rear armory and get a weapon. I’d never fought like that, before. Never really been scared like that, before. I know it’s not affected Cap… Major Reynolds. I got that gear on, and got armed up, and he took over again, like always. I took a position in the old tank room, where our power distribution is, now, and picked ‘em off one by one, as they tried to sneak in and divert power away from the failsafe. Once everyone got it together, we managed to repel the invasion and close off the gate, but it was close going for a while. I doubt they’d have broken loose, but if they’d gotten control of that failsafe, there’s not a lot we could have done. I think the Air Force was flying a bomber toward us with some of those bunker busting weapons, but I’m not sure how far that would penetrate. It’s not Major Reynolds I’m worried about. But Axsel’s going to have a hard time getting over this. Doctor Chardon is all over me to talk to her. Maybe I should, but I don’t want to risk being grounded for any length of time. Major Reynolds is fine, and this fight is too important. Talk about a twisted ride! I’ve dealt with rez-tech before. We use all sorts of advanced healing devices from the Ancients, Asgard and Goa’uld. I’ve had all manner of terrible things done to me, and brought back to fight again. But, there are limits. Sometimes dead is dead. Some things they just can’t bring you back from. Or, so I thought. We went to this world, Leonops, to investigate some kind of advanced healing tech. I don’t think the egg heads expected it to be any better than our current tech, but it supposedly worked in a wide field, which would allow for projected healing of an entire battlefield. Not a bad toy. Trouble is, the healing tech was built into a world class psycho Goa’uld’s play toy. An arena that allowed him to watch people fight, over and over and over again. No matter how badly they got killed, blammo, they resurrected ready for more. And we’re the idiots that reactivated the device. Now we get to play his game. Fun! I keep insisting on better intel before we go storming into these new places. But, I guess, I mean, what could we have known? This isn’t like not hearing about tanks parked just outside the objective. There’s no satellite or drone intel that we were missing, or had been botched. This is a world none of us had been to before. Even the System Lords that dropped in on us got trapped, not knowing what to expect. The truly amazing thing about this insane device we got caught in is that every time you die, and are resurrected, it’s like you’ve had a full nights sleep. If it wasn’t for the bloody pain and terror of it all, I’d say it was refreshing. And, in a way, that added to the evil of the place. Normally, in a fight, no matter how long the overall battle lasts, both sides lull and rest. The human and even goa’uld can only sustain intense levels of action for so long before you simply must rest. But this blasted machine eliminates that need. I don’t know how long we fought. Maybe an hour, maybe two weeks. I lost track of it all. I just tried to kill as many as I could, and tried not to become a victim. No matter what happened, we’d all resurrect after a few minutes, but getting stabbed in the heart, or taking a staff to the chest… those are things you never get used to, and even when not fatal or permanently injurious, they’re things I’d rather not experience again. I guess we filled up some automated evil entertainment meter, because eventually the device shut off, leaving us alive, and the System Lords were just gone. Maybe someone else kept track, but I assume we won. Though I don’t know if that means we suffered more, or killed more. Who the heck can tell with these twisted Goa’uld. I guess the egg heads got what they were looking for in the end. I hope it was worth it.